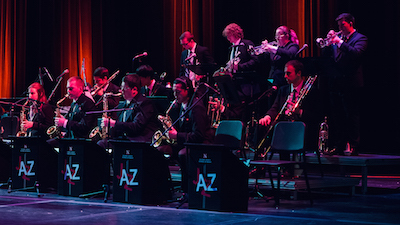 Big Band is a vital component of the University of Nebraska-Lincoln jazz curriculum. Through intensive rehearsal and performance, students are encouraged to develop and nurture the fundamental skills necessary to perform a wide variety of repertoire, and to engage in the creative process through improvisation. UNL Big Band is specifically designed to motivate and inform music educators and aspiring teachers through innovative programming and pedagogical methods. Rehearsals are 150 minutes a week on Tuesdays and Thursdays from 1:30 to 3:00. Membership in Big Band is determined by audition each semester, and music majors as well as non-majors are encouraged to try out. Audition music and concert schedule information is available at https://music.unl.edu/jazzstudies/auditions-unl-jazz-ensemblescombos.